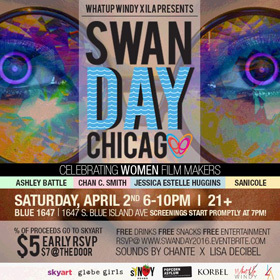 Women in the Arts and Media Coalition: SWAN Celebrations in Miami, Chicago, and Staten Island! SWAN Celebrations in Miami, Chicago, and Staten Island! 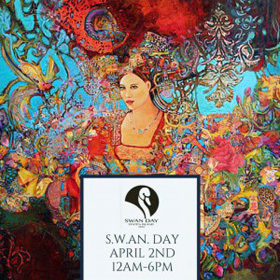 "Every single year our SWAN festival significantly changes a woman's artistic career. A sisterhood is formed . . . artists start producing their own events with SWAN sisters, or they meet someone who buys their most expensive painting, or they are simply inspired to continue on their artistic path when they were thinking about giving up." 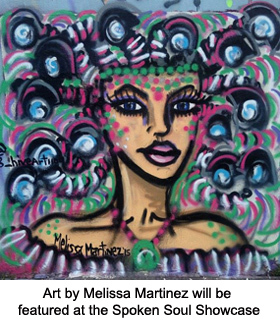 Fifteen women artists from southern Florida will be featured in the ninth annual SWAN Spoken Soul Showcase this Saturday, April 2 from 6 p.m. - 10 p.m. at the Little Haiti Cultural Center in Miami, Florida. The Showcase will include a free performance by spoken word artists, musicians, and others in the Center's state-of-the-art theater, and an exhibit of work by women visual artists covering two entire floors at the Center. Santos Sangria will generously provide free sangria. The Showcase is part of the three-day SWAN Spoken Soul Festival, which also includes a day of women-led community-service arts workshops and the Vanessa Baez Memorial Brunch, an annual fundraising event for the festival and a community partner. This year's community recipient will be MUJER, an organization that helps victims of domestic violence and sexual assault. Deborah Magdalena, a multi-talented spoken word artist, actress, singer, and television host, started the Spoken Soul Festival as a way of helping women artists advance their careers. Her original idea was to create a showcase for Miami's female spoken word artists, but she quickly realized that other kinds of artists wanted to be involved. The festival now includes all kinds of artists. 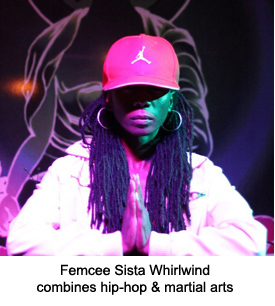 For this year's Showcase the "Femcee" will be writer/performer Sista Whirlwind, "the first emcee to combine hip hop and martial arts." The Showcase performer line-up includes 2 singers (Chaquis Maliq and Janae Catt), 3 poets (Ni'ja Maxwell, Rebecca Rubin, and Emonde M. Prosper). Since a primary goal of the festival is to help women artists advance their careers, it provides the artists with three months of free publicity, a free venue to show their talents, and many networking opportunities. This model works well. In the words of Deborah Magdalena, "The artists leave the festival eager to network more, fired up to follow their dreams, to finish that album, to set the standards higher for themselves. That is a gift in itself!" Other SWAN Events This Weekend! While You Are On Staten Island . . .